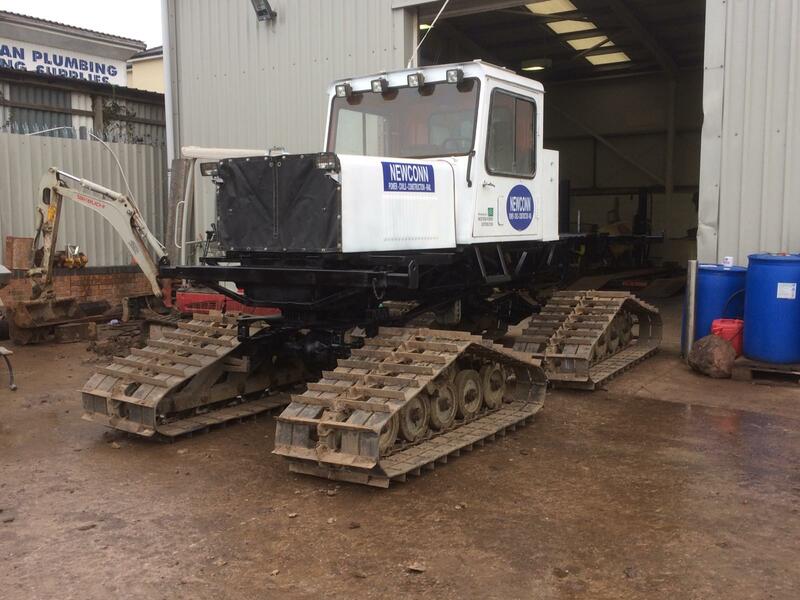 Newconn are excited to announce their plans to introduce a state of the art All Terrain Wood Pole Planting vehicle that is being developed through the conversion of an Antarctic Snow Cat (the only one in the country). These units are custom built by Tucker in the USA. We have been advised that the unit we were able to purchase is only 1 of 16 examples of this model built and the only one in the UK. This unit was constructed for the British government for Antarctic expedition and we are told saw service in the Antarctic. It is our intention to convert the unit into an all terrain wood pole installation unit for use on our contract with Western Power Distribution. Our area of operation includes the South Wales Valleys and coastal wetlands where access to some sections of overhead lines and wood poles are very difficult. This unit will traverse bog and soft ground without sinking due to its displacement and will also tackle steep gradients, perfect for work in the above area. We are presently restoring the vehicle, however, it must be said, the condition for the age is very good in the outset due to the maintenance that has been carried out from being Government owned. We are installing a suitable Palfinger crane for pole erection together with a front linkage mounted 10 ton winch. The new all terrain wood pole vehicle is currently being converted at Newconn headquarters and will be available for use by early February 2019. Once out on the field further photos and news of the All Terrain Vehicle showcasing the many benefits it will offer Newconn through the remainder of this winter and for years to come. For more information about the new all terrain vehicle and Newconn services please contact us here.